We are well into summer time (given it's the end of July), but if you know Florida, you know we are dealing with summer temperatures for a couple more months. And then we will have sort-of-summer-sort-of-fall temperatures. Either way, it will be warm. And humid. So, if you're planning on visiting Walt Disney World, how are you possibly going to babywear while you're in this summer heat? Is it even possible? If you're looking for a wrap, a Wrapsody Baby Breeze is absolutely the way to go! This lovely wrap is a cotton/linen blend and it is SO thin. Ridiculously thing. Freakishly thin, guys. But even tho it is so thin and breathable, it's totally toddler worthy (and yes, chunky baby worthy). It is the thinnest woven wrap I have ever worn. 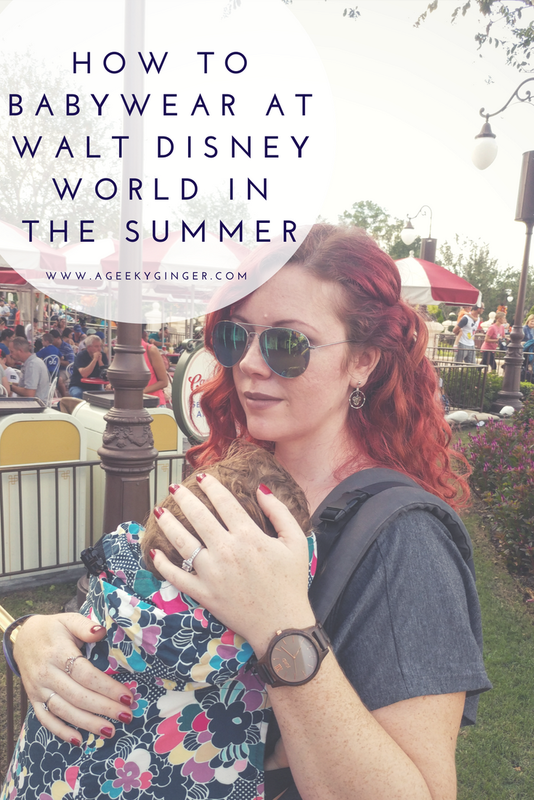 I've done hot summer days, wearing my breastfeeding baby all day, whilst at Walt Disney World. This wrap is legit. 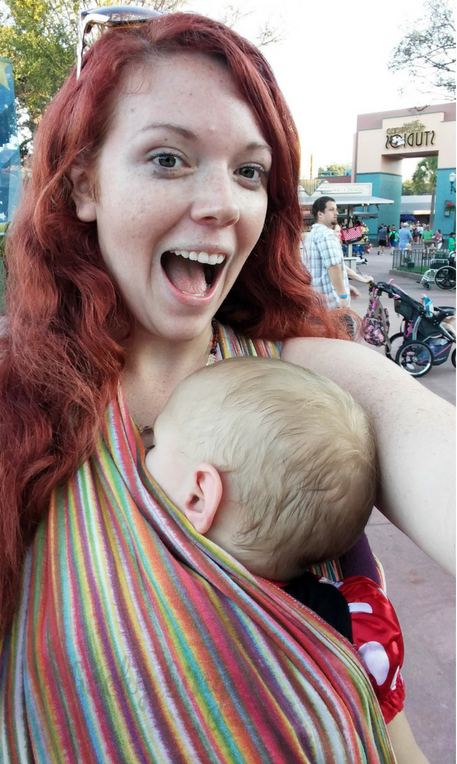 If you need a wrap for Disney, get the Wrapsody Breeze. Kid you not. Now, an awesome favorite of mine that I think is horribly overlooked, is the Onbuhimo. The lack of waistband is BEAUTIFUL for a hot summer day at Disney. Who wants all that back sweat? And front sweat? And side sweat? In fact, if you profusely sweat, just go ahead and get yourself an Onbuhimo. And while you're at it, get the Mer Buckle Onbuhimo that Naked Panda Designs offers! It is a super comfy, supportive, soft, FREAKING WATER CARRIER that is beautiful and amazing and you should own one. You can sweat all day in that, and you're good. Also, you can hit one of the little splash areas at Disney (like in Epcot) and cool you and your babe off while still wearing! I know.. it's incredible. Check it out. The Enduracool Towel is a must-have. I have tried several of these cooling towels out there, and this one is by far my favorite. We've been using the same ones for 2 years now, and I still am amazing by them. They absolutely will help keep you from overheating. I like to place it in between me and baby (if they're on the front of me) on our chests, to keep our temps down. I've also put it on the back of baby's neck right at the base of her skull, to help regulate her body temp. Our bodies are absolutely incredible, in that they can sense when baby is overheating, and it will drop our temp a degree or two to help. BUT in hot Florida summer, ya gotta have some help. These are definitely amazing. Also, fans. Fans, guys. Use them. One that I really love is this battery operated fan. It's rechargeable and pretty high powered. I hook these right onto the shoulder of whatever carrier I have on, and have it face baby (and me if I need it). They're pretty great. Also, if you're pushing a stroller but are still wearing baby, you can hook this onto the stroller and have it face you two. Recharge them overnight and you get some good usage out of them during the day. This handheld fan is pretty amazing, too, if you don't mind just holding it. High powered and rechargeable! Definitely bring a fan or two if you're here in the dead-set of summer. You'll need it. So, it feels kind of silly for me to even say this, but having worked at Walt Disney World and all the stories I've heard.. I want to make it clear. not try to keep going. Find somewhere cool to recharge yourselves, and start again. The humidity in Florida makes the heat much, much worse. So even if you think "Yeah, we get 85 degree days here, we'll be fine", it doesn't matter. It is hotter in Florida. You absolutely can safely, successfully babywear at Disney in the summer. But you absolutely must pay attention to your limits. If you need to leave a line you're in to go cool off, let a cast member know and see if they can help in some way (like saving your place). They understand that heat exhaustion exists and is not safe. So please, please take heed and don't push yourself. Anyway, that's my advice. I've been going to Walt Disney World my entire life and have been babywearing at it for 10 years now. 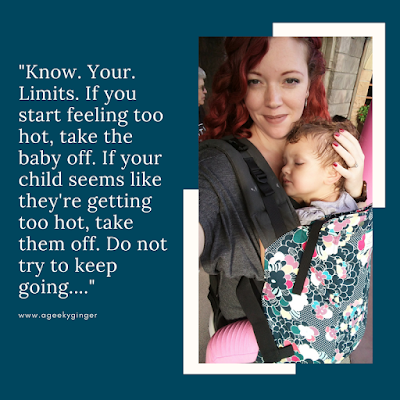 We have yet to have any bad heat exhaustion moments and have successfully worn on just about every single trip in the past (almost) 4 years of going with my youngest! I hope this helps! 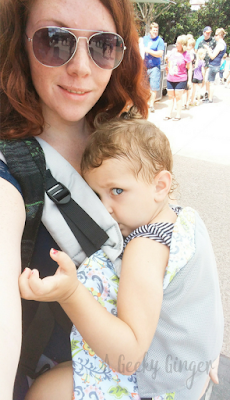 Check out if & where you can babywear on rides here! 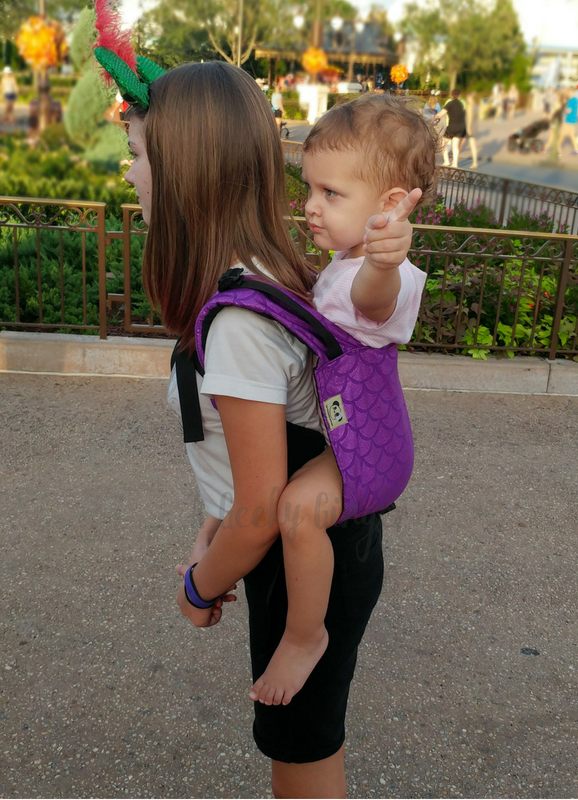 Do you babywear or plan to babywear at Walt Disney World? What are your concerns? Post in the comments!